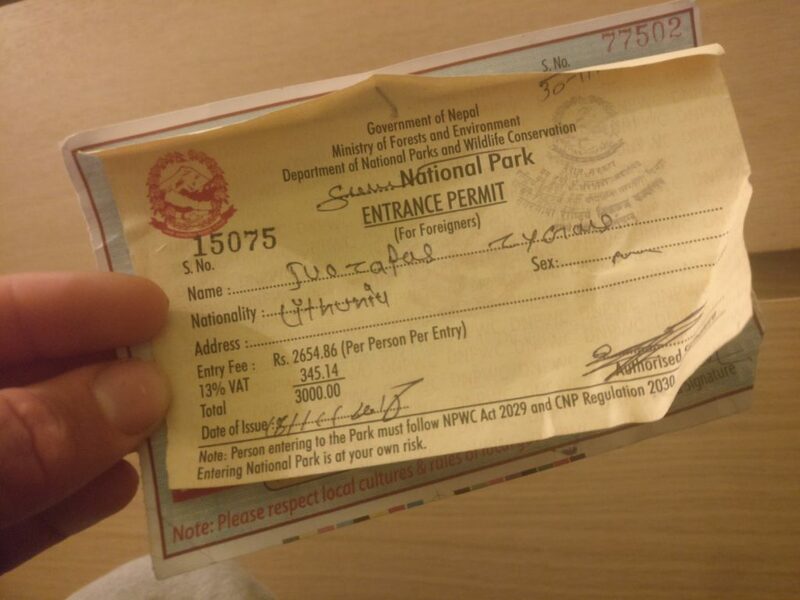 Sagarmatha National Park entrance permit (yellow ticket) which costs 3000NRP including all the fees. You don’t need any picture of yourself, just 3000NRP in cash. You will need to buy this ticket just after Monjo, before Jorsalle. Make sure you don’t miss the ticket booth. You might be checked in Namche Bazaar and above. If you will no have the ticket you will need to go back or pay the double price. Avoiding to pay this permit is not really worth it. Sagarmatha National Park ticket. Price – 3000NRP. Khumbu Pasang Lhamu Rural Municipality ticket. This one is not that strict and is not going to be checked later so if you want you can try to avoid this permit. Price for this ticket is 2000NRP and you will need to buy it before Monjo village. Khumbu Pasang Lhamu Rural Municipality ticket. Price – 2000NRP. 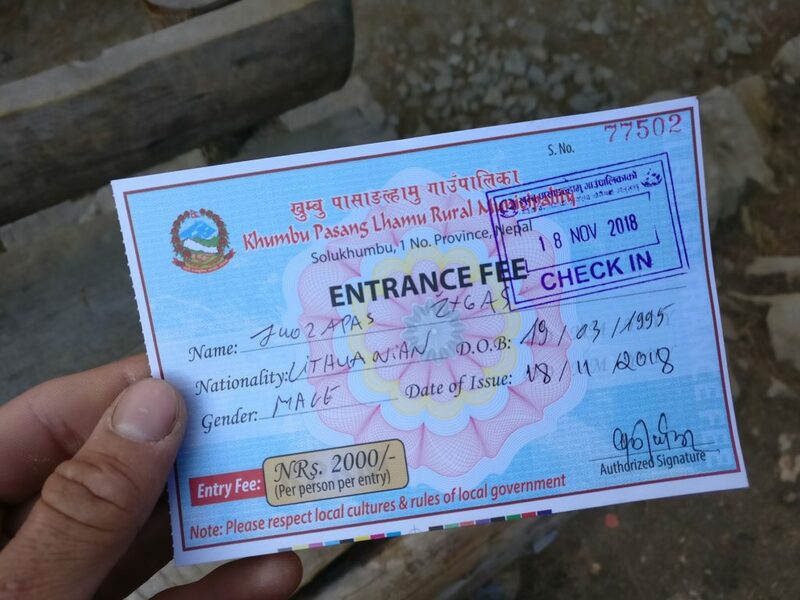 Everest basecamp trek permit fee. If you want to hike to the famous EBC you will need 2 permits. First one is Sagarmatha National Park and second one – Khumbu Pasang Lhamu Rural Municipality. Both of them will cost you 5000NRP and both of them can be attained on the go in the villages on the trek. You don’t need to arrange it in Kathmandu or other place in Nepal. Three passes hike permit costs. Three passes is long and quite hard trek in Sagarmatha National Park. You will need the same 2 permits as for EBC trek, both of them will cost you 5000NRP. You can get them on the way from Lukla to Namche Bazaar. Gokyo Lakes trek permit fee. Gokyo lakes are also part of Sagarmatha National Park and you will need the same tickets as for Three Passes trek or EBC hike. Price is 5000 Nepalese rupees and you can get them before and after Monjo village. TIMS (Trekkers Information Managing System) card is not needed for any of the treks in Khumbu valley or Sagarmatha National Park. You will need it for other treks in Nepal, but this region is not part of this system. So do not waste your time trying to get one in Kathmandu. Pay your permit fees on time and enjoy beautiful treks in Sagarmatha National Park! Thanks Sinjana. The place is definitely amazing and worth a visit. Didn’t have an idea on these park payments in Nepal. Good to know as we are planning to explore Nepal this year. 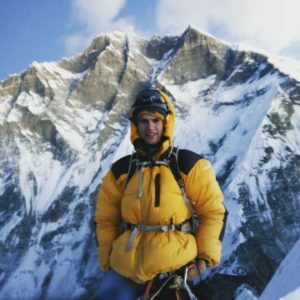 I visited the Sagarmatha National Park earlier this year and had an amazing time! I think you covered all of the important aspects one should know before going there. I have some other articles including packing list and itineraries for Three Passes trek. This post is mainly about entry fee for Sagarmatha National Park.